Richard S. Kayne is Silver Professor in the Department of Linguistics at New York University. 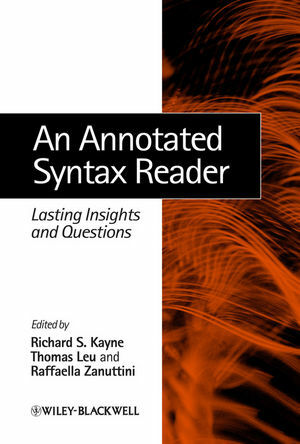 He is the editor of Oxford Studies in Comparative Syntax, and author of French Syntax (1975), Connectedness and Binary Branching (1984), The Antisymmetry of Syntax (1994), Parameters and Universals (2000), Movement and Silence (2005), and Comparisons and Contrasts (2010). Thomas Leu is Assistant Professor of Linguistics at the Université du Québec à Montréal. Raffaella Zanuttini is Professor of Linguistics at Yale University. She is the author of Negation and Clausal Structure: A Comparative Study of Romance Languages (1997).